The use of this flag design is FREE of charge to use on social media or any other non-commercial use. If you agree to the following, then click on the image above to download the large PNG of the flag. For commercial use, we request that, If you would like to use this flag design to create items to support your work/activism, you donate at least 50% of profits from any sales to specifically support Black Trans people, Indigenous Trans people, Trans people of color. We ask that you raise the voices of Trans people of color with this flag and beyond. Can a movement truly create change without taking the voices of those it claims to want to support into account? Simply put, the answer is “no”. While this truth is painfully obvious to Communities of Color, the white-led and centered LGBTQIA+ community still fails to recognize the effects of intersecting oppressions on Black and Brown bodies and the need to center the most marginalized in its community. A recent example of this was last year’s unveiling of yet another new Pride flag design – “Reboot Pride Flag” – designed by a white queer non-binary demi-guy. The flag claimed to be a symbol of inclusion and raised over $25,000 for the designer – on the back of People of Color and with a design suspiciously based on the Pride flag of Countries of Color, including the Puerto Rican Pride Flag. 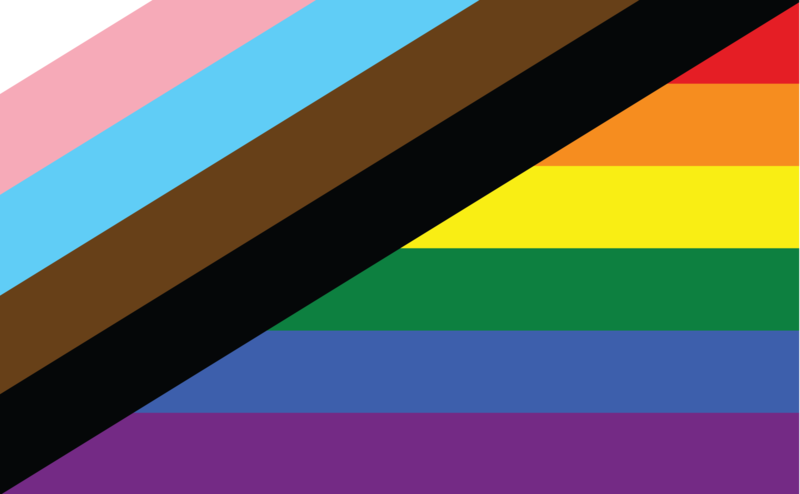 The colonizer explained of their design that, “The 6 stripe LGBTQ flag should be separated from the newer stripes because of their difference in meaning, as well as to shift focus and emphasis to what is important in our current community climate.” However, just from this statement from the designer themselves, the Reboot flag design ignored what is most needed by the movement, which is the centering of the most vulnerable – not further exclusion because of our differences or yet another performative symbol committed to the continuous silencing of Trans and Queer People of Color (TQ PoC). Black and Brown Trans Women/MaGe (marginalized genders) are targeted and murdered at the highest rates out of any member of the LGBTQIA+ community. Latinx are more likely to identify as part of the LGBTQIA+ community and LGBTQIA+ People of Color experience higher rates of attacks and discrimination than white LGBTQIA+ folks. Yet, “What does race have anything to do with Pride or sexuality?” is an all-too-familiar response from a very white-centered movement invested in cosmetic progress and shallow inclusion. Ironically and sadly, homophobic People of Color often find themselves repeating the same question, as they also tend to ignore the uncomfortable interconnections of race, gender, and sexuality as it applies to their own communities. As TQ PoC battle being caught in the middle of intersecting oppressions and communities, the question remains, as we roll into the 50th anniversary of Stonewall and the upcoming Pride season, whether are we ready to raise our own voices, finally decenter whiteness for good, unapologetically center our own, and ensure that credit for the movement is given where it’s due. 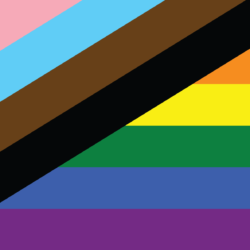 Going further with an anti-capitalist goal, the flag design was created to be used by all but to especially create awareness and raise money to support Black and Brown trans MaGe from those with privilege. Feliz explained that, “The TQ PoC New Pride Flag was created FOR the people it is meant to support. This isn’t about my making money and should never be. This is about supporting the most marginalized in the movement. 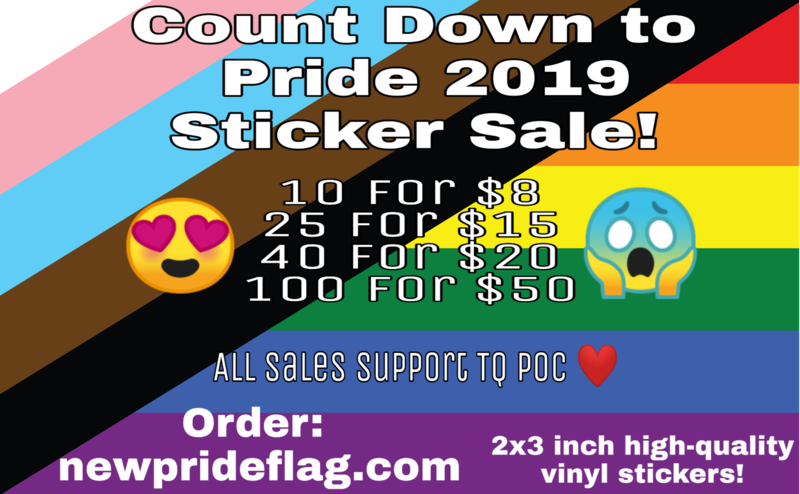 The only restriction placed on the flag is that if merch is going to be sold that at least 50 percent of the money made should go towards supporting Black Trans people.” After months of crowdfunding last fall, the grassroots campaign raised enough money to print a batch of sticker. By the end of 2018, we were able to donate what we had raised from stickers and other merch sales on the site to Cookie’s Joint, Harlem, a pantry and crisis support organization for TQ PoC, TGI Justice Project, a Black-led TQ PoC organization, and the Santa Fe Dreamers Project, which is specifically working to help migrant TQ PoC. For 2019, the grassroots campaign has teamed up with Jery Che, a Trans & Queer Non-Binary PoC and owner of the Etsy shop “Stick to Resist” in order to help make stickers and pins as accessible as possible. PRIDE 2019 is on its way! Help us spread the flag EVERYWHERE and raise money for TQ PoC!